How does MTConnect compare to Fanuc FOCAS? Enables manufacturing equipment to provide data in structured XML rather than proprietary formats. Ethernet or HSSB based. Library files (.dll) accessed by applications to retrieve machine data. How is Fanuc FOCAS different from MTConnect? While MTConnect enables manufacturing equipment to provide data in structured XML rather than proprietary formats, Fanuc FOCAS machine data collection is Ethernet-based or sourced via the Fanuc Focas HSSB driver. Library files (.dll) are then accessed by applications that retrieve the machine data. Don’t have a Fanuc machine? See how MTConnect compares to more protocols! More info via our MTConnect compatibility page: Common data that is available through the FOCAS are CNC state (running, idle, alarm), part count information, program name, number, size, and date modified, tool and work offsets, alarm number and text, feed overrides, parameters, positional data, spindle speed and Modal data. Below is a small, sample list of controllers that would feature FOCAS. Older controls can have the embedded board retrofitted or added to the machine using the Data Server Board by contracting FANUC directly. MTConnect is a standard for formatting and transmitting data produced by manufacturing equipment so that it can be processed by software applications. Common uses for this technology are real-time machine monitoring, and historical reporting using charts, graphs, and other visual representations of a shop’s performance. The protocol enables more attainable and less cost-prohibitive manufacturing productivity. 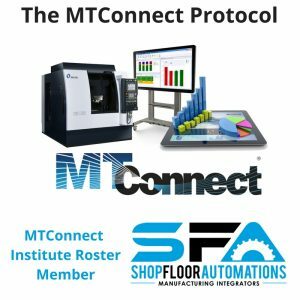 What makes Shop Floor Automations (SFA) qualified to answer MTConnect questions?